Dramm Watering Nozzles, Shut-offs, etc. 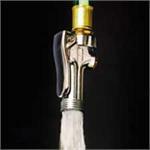 Combination watering device with convenient thumb lever shut-off valve and two interchangeable heads. Attaches to standard garden hose. Chrome plated copper angled spout. Thumb valve designed for ergonomic comfort.